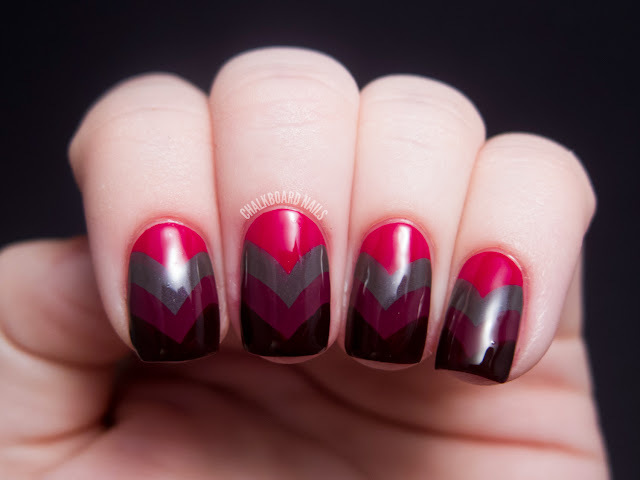 Today's post is one of my favorite nail art looks... the fishtail chevron! This is the second of my China Glaze On Safari nail art looks, the first being the blinged out leopard print. For my base color, I started with two coats of China Glaze Adventure Red-y. I really could have gotten away with one coat on this one, but I went with two for good measure. It's very opaque and the next photo is the most color accurate. It applied beautifully. Then, using the polish brush, I freehanded on curved chevrons in China Glaze Jungle Queen, Purr-fect Plum, and Prey Tell. All of these colors required two coats for full opacity in this nail art look. Jungle Queen is a dark purple-gray color with a violet shimmer that only shows itself at certain angles. I can definitely see myself craving this color a lot once the cool weather returns. Purr-fect Plum is a gorgeous berry shade. Rich and sumptuous! Prey Tell is a dark dark burgundy jellylike shade. I am not really into that kind of color but it worked well in this manicure. If you are interested in trying out the fishtail chevron, never fear! I have made a video tutorial for this look in the past, which you can find here! What do you think? Are you a fan of these moody, vampy colors? 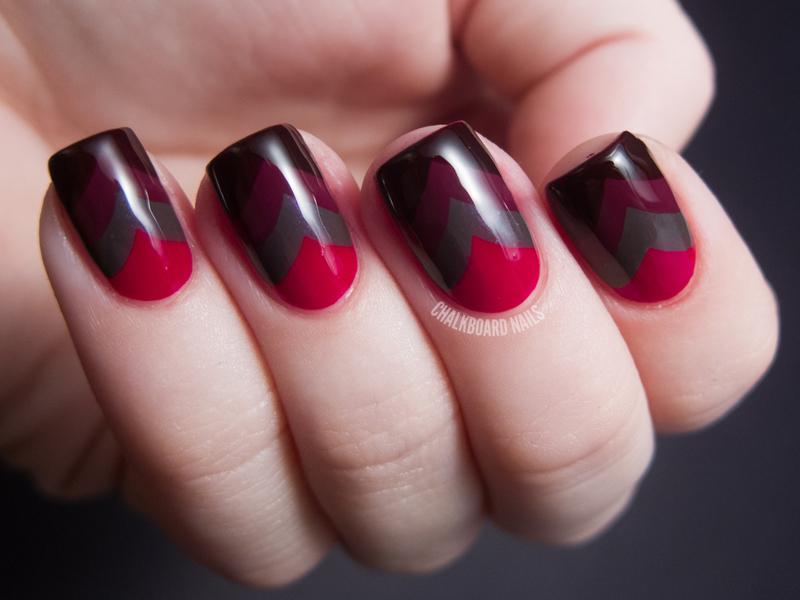 Have you ever tried a chevron manicure like this? The China Glaze On Safari collection is available now at salons and beauty supply stores nationwide. Individual polishes retail for $7 MSRP. The products in this post were sent to me by the manufacturer or their PR. Stunning! The colours you chose work perfectly together! Beautiful. You're very neat with the freehanding! I am a huge fn of vampy colours and you just made me want to get all of them! This is stunning and the colours work wonderfully together. u're gifted at freehanding, I should try this kind of design! I think those are gorgeous colors that work together. I have a growing collection of polishes that contain colors I do not like. Though, when you pair them up in a snazzy little style they are fab! love love love these colors!!!! This is so beautiful! I love the color scheme. Love the color combo! Wish I had the patience to do that! Wow! This is too cute! Love the colours! Maybe you could try a gradient fishtail? A bit of MrCandiipants mixed with a bit of Chalkboard Nails. Y'know, I might actually give this a shot. Wow! Cute & so clean looking! I didn't love these polishes before, but they look great together here. I would have never put together this combo. Awesome, as usual. I like how it turned out, I have all four shades but only tried adventure red-y and I find that a pretty impressive red. 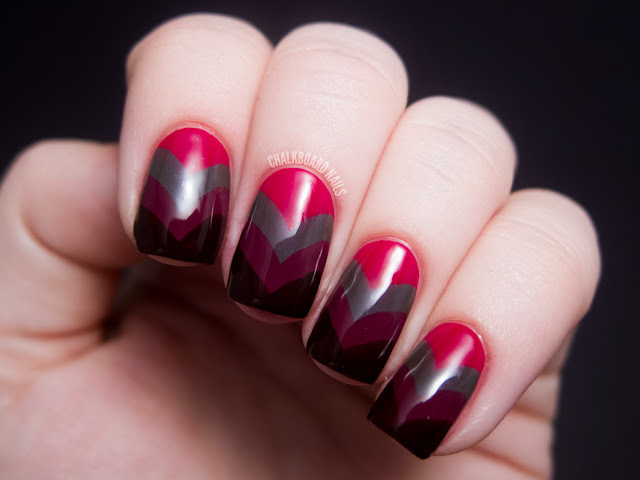 Just checked out your video tutorial as well, you do you freehand nail art SO NEAT! Spectacular!!! I have not yet done a mani like this but am going to do the fishtail braid soon. I love the colors from the Safari collection--you paired them up beautifully! I am in awe of the steady hand you have ;) I have to use tape. This is so, so cute. I love how the colors look together! ola!! 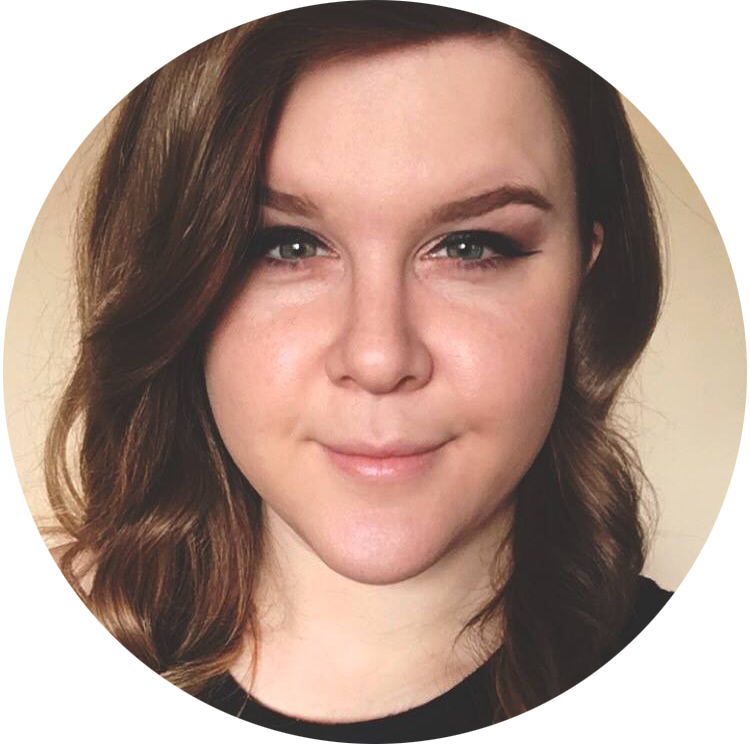 sou brasileira e acompanho seu blog ha um certo tempo!! adoro suas art nails!! The coloring on this one is gorgeous!